But where would you go if you were looking to lace up your boots and hoist up your pack for a longer walk? Olympic National Park is a backpacker's paradise, offering a variety of mind-blowing terrain that is totally unique. To kick-start your research, we propose looking at these fantastic extremes: a hike along the lowest point in the park, and loop through some of the park's stunning alpine terrain, and a through-hike from the rainforest through the high country. This section of trail covers over 17 miles of the most rugged and remote wilderness along the Olympic Coast. Be prepared for an intense variety of terrain ranging from river fords and routes along the surf line to steep and muddy treks into the old-growth rainforest. All of these challenges are amply rewarded by the incredible scenery. Pitch your tent right on the sand and browse the tide pools as the sun sets between iconic sea stacks, and sleep with the sea and the stars. This is a wilderness trip like no other. There are no bad campsites along the High Divide Trail. Photo by Sara Carroll. The High Divide Trail is a treasure in a trove of treasures. If you are lucky enough to explore this area, expect a quintessential Olympic alpine experience. Wildflowers, snow-capped peaks, jagged outcroppings, placid lake camps: this area of Olympic National Park is truly a special one. This 18-mile loop rises out of the Sol Duc area and encircles the Seven Lakes Basin, providing fantastic views throughout. Animals love the natural protection and the abundant water supply in the basin, so keep your eyes peeled for elk and bear. There are plenty of fantastic sites to choose from along this route, whether near lakes or on ridges. 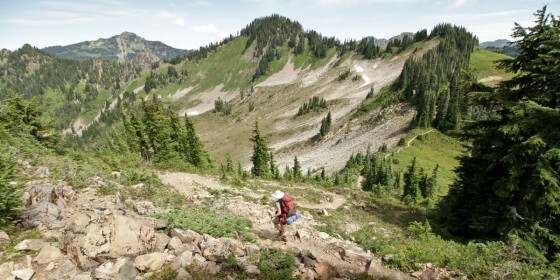 This is a spectacular way to see the high country in Olympic National Park. Switchbacks and stunning views on a longer trip through the Olympic Mountains. Photo by Heron Marychild. This incredible route incorporates the majesty of the Seven Lakes Basin and adds to it the splendor of the iconic Hoh River and Hoh Rain Forest. This route can be hiked in either direction, though moving from the Hoh Guard Station toward Sol Duc carries the advantage of leaving you closer to Port Angeles once you've finished, and it puts less descent-stress on your knees. Either way you'll be moving between the rain forest and alpine ecosystems, along two powerful rivers, the Hoh and Sol Duc, and by the banks of several pristine lakes. Plan on taking your time along this route: five hiking days should give you plenty of time to explore. While a little longer than the High Divide Loop, this is a superb choice if you have the time and energy. 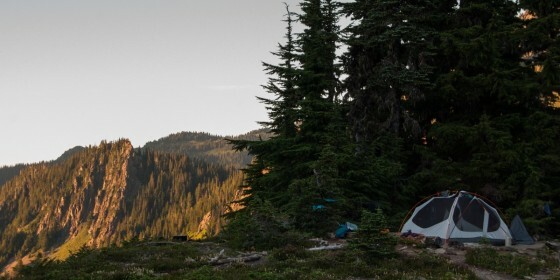 Wherever you go, backpacking in Olympic National Park is some of the finest in the nation. Of course, as is the case in many national parks, permits and regulations apply to these and other routes, so be sure to do a little research on the individual adventures beforehand. And don't forget to come back and share some photos with us when you're done! Bringing the kids along? Take a look at some incredible ways to experience Olympic National Park when circumstances call for a more family-friendly itinerary!